To automatically identify small- to medium-diameter bronchial segments distributed throughout the lungs. We segment the peripheral pulmonary vascular tree and construct cross-sectional images perpendicular to the lung vasculature. The bronchi running with pulmonary arteries appear as concentric rings, and potential center points that lie within the bronchi are identified by looking for circles (using the circular Hough transform) and rings (using a novel variable ring filter). The number of candidate bronchial center points are further reduced by using agglomerative hierarchical clustering applied to the points represented with 18 features pertaining to their 3D position, orientation and appearance of the surrounding cross-sectional image. Resulting clusters corresponded to bronchial segments. Parameters of the algorithm are varied and applied to two experimental data sets to find the best values for bronchial identification. 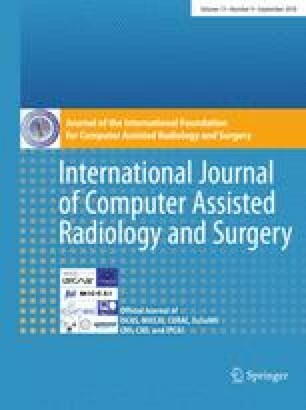 The optimized algorithm was then applied to a further 21 CT studies obtained using two different CT vendors. The parameters that result in the most number of true positive bronchial center points with > 95% precision are a tolerance of 0.15 for the hierarchical clustering algorithm and a threshold of 75 HU with 10 spokes for the ring filter. Overall, the performance on all 21 test data sets from CT scans from both vendors demonstrates a mean number of 563 bronchial points detected per CT study, with a mean precision of 96%. The detected points across this group of test data sets are relatively uniformly distributed spatially with respect to spherical coordinates with the origin at the center of the test imaging data sets. We have constructed a robust algorithm for automatic detection of small- to medium-diameter bronchial segments throughout the lungs using a combination of knowledge-based approaches and unsupervised machine learning. It appears robust over two different CT vendors with similar acquisition parameters. We would like to acknowledge and thank the Commonwealth Government of Australia for the support of Daniel Moses during his Ph.D. through an Australian Government Research Training Program Scholarship. All procedures performed in studies involving human participants were in accordance with the ethical standards of the institutional and/or national research committee and with the 1964 Helsinki declaration and its later amendments or comparable ethical standards. For this type of study, formal consent is not required. This article does not contain identified patient data.